In what appears to be a coordinated effort to turn the local community against the Ammon Bundy led “Citizens for Constitutional Freedom” militia group currently occupying the Malheur National Wildlife Refuge headquarters near Burns, Oregon, a local Fire Chief claims to have caught undercover FBI agents posing as militia members in order to harass residents. For the full back story that details the federal corruption and other issues surrounding why a group of armed men would choose to take a stand against their government, you can click HERE – but its important to understand that the FBI has a rich history of abuses. Among these include the Bureau running various sting operations across the country that target vulnerable and even mentally ill people by luring them into participating in fake terror plots concocted by agents themselves in order to make “busts” and pat themselves on the back. In other words, the possibility of the FBI running a psychological operation aimed at fomenting local sentiment against the militia members in Oregon is certainly plausible and is not without historical precedent. The Bureau has infiltrated militia groups many times before, but perhaps some of the most notable similar tactics that have been documented include a series of covert, and at times illegal projects conducted to “expose, disrupt, misdirect, discredit, neutralize or otherwise eliminate” the activities of domestic political organizations. Called COINTELPRO, the counter intelligence measures targeted movements and leading Americans who criticized the Vietnam War including Senators, civil rights leaders like Martin Luther King, journalists, athletes, and others between 1956 and 1971. Its hard to imagine these operations ever stopped or didn’t continue under a different name but one thing appears to be clear: the FBI is up to its old tricks again. I just got off the phone with the former Fire Chief of Burns, Chris Briels, the Burns Fire Chief from 1984 to 2006. When he retired in 2006 the county asked him to stay on as the county Fire Marshall. According to the conversation I had with Chief Briels today at 12:26 p.m. Pacific time, he disclosed to me that the Sheriff’s office and Judge Grasty has been telling the community that the “militia” have been following and harassing people. Chief Briels observed what he thought was “militia” poking around the Armory and following townspeople so he took it upon himself to pull them over. 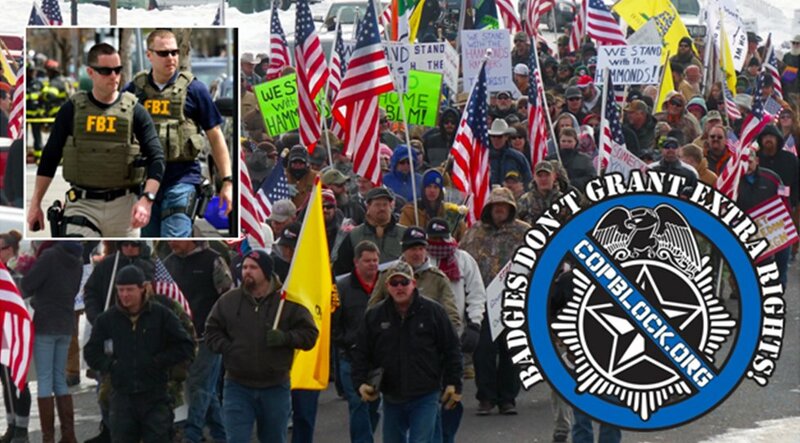 According to Chief Briels these men posing as “militia” were the FBI. Chief Briels was so upset he has just resigned as the county Fire Marshall. He has gone public with this information. Harney County Sheriff Dave Ward has said that officers and U.S. Fish and Wildlife employees have reported being followed to their homes and observed while inside by self-identified “militia members” who have tried to engage them in debates about their status as federal employees and intimidate them. Were these people really militia members? At a small press conference held on Wednesday, Briels told his story. The now-former Fire Chief corroborated Fiore’s account and maintained that he indeed caught undercover FBI agents attempting to stir up trouble by harassing locals. In other words, it is once again up to the alternative media to bring you this story – and it is important it gets out. Especially considering the history of how the FBI and other federal agencies have addressed similar situations in the past in places like Waco, Texas and Ruby Ridge, Idaho. After two weeks of occupation, the FBI now leads the coordinated law enforcement response in Burns and is working with the Harney County Sheriff’s Office, the Oregon State Police, and other local and state agencies. “Due to safety considerations for both those inside the refuge, as well as the law enforcement officers involved, we will not be releasing any specifics with regards to the law enforcement response,” the Bureau has said. They maintain they are looking for “a peaceful resolution to the situation” but have not commented on Briels’ allegations. At a press conference earlier this week, a spokesman for the militia group said they plan on meeting with the local community on Friday to outline in greater detail why they are there and discuss a time table for their departure. An imminent withdraw from the area was not alluded to however, and seems unlikely. Update: In statements made to the U.S. News and World Report, Briels has attempted to clarify his statements about what he observed at the Armory. In other words, Briels maintains that he didn’t witness an overt attempt made by the spooks to out rightly identify themselves as militia members, but this doesn’t silence concerns about infiltration and the possibility of a psychological operation geared toward residents. After all, the FBI has still not denied the allegations and one would think that the Bureau would know exactly how they might be perceived if covert agents began wafting around the area stirring up trouble dressed like militia members. The reality that they didn’t say “I’m militia” means little, but what ever the case, one thing is clear: activists and protestors in Oregon need to stay vigilant.